We can assist wheelie bin cleaners with their public liability insurance needs. Cover starts from just $377 for $5 million cover, and thanks to our online system you can have your certificate of currency emailed within minutes. Trade Risk is an award winning insurance brokerage with thousands of happy clients all over Australia. To get started, select from the options below or call us on 1800 808 800. Public liability will respond in the event that your business activities result in property damage or personal injury to another person. 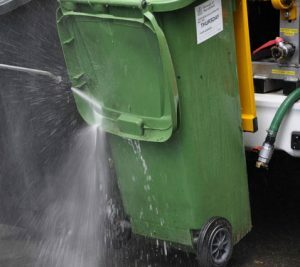 As with most trades and services, there is ever-present risk when cleaning wheelie bins. You’ll know them better than anyone, but there is certainly the potential for property damage or personal injury, not just to the property owner, but also to passers-by. In saying that, it’s fair to say wheelie bin cleaning isn’t the most dangerous activity in the world, and that’s why the premiums for this business type are so low. As well as your public liability insurance, Trade Risk can also assist with general property insurance (also known as tool insurance) as well as commercial vehicle and trailer insurance. We can also assist with income protection via one of our referral partners. It doesn’t matter where your wheelie bin cleaning business is located. We’ll be about to get your insurance sorted. Our office is located in Brisbane, however we assist thousands of trades and services small business from all states and territories of Australia. We can look after you online, over the phone and via email. Or if you’re based in Brisbane and prefer the old fashioned way, you can drop into our office any time. For more information or to obtain a quote please call our award winning team on 1800 808 800. * Indicative quote of $377 is based on $5 million public liability insurance for a wheelie bin cleaner based in Queensland.